There should be a USB cable, SD card and Log4.USB device in the box. The Log4.USB should be fully charged upon arrival. Short press START/STOP key to start the Log4.USB Device Fig. 5. The display will turn ON almost immediately. To turn off the device, press and hold the START/STOP key for around three seconds till the screen turns blank. Plug micro-USB to Monitor USB port of the Log4 Device, if battery is not fully charged, the CHARGE/READY light will be red. If battery is fully charged, the CHARGE/READY light will be green. It takes approximately 6 hours for the device to be fully charged. Connect USB IN to PC/ Laptop Fig. 6. Connect USB OUT to the device want to measure (in this case, a Raspberry Pi). Press START/STOP key to wake the Log4 Device if it is not already on. A start-up screen should be around for three seconds. Ta daaa! 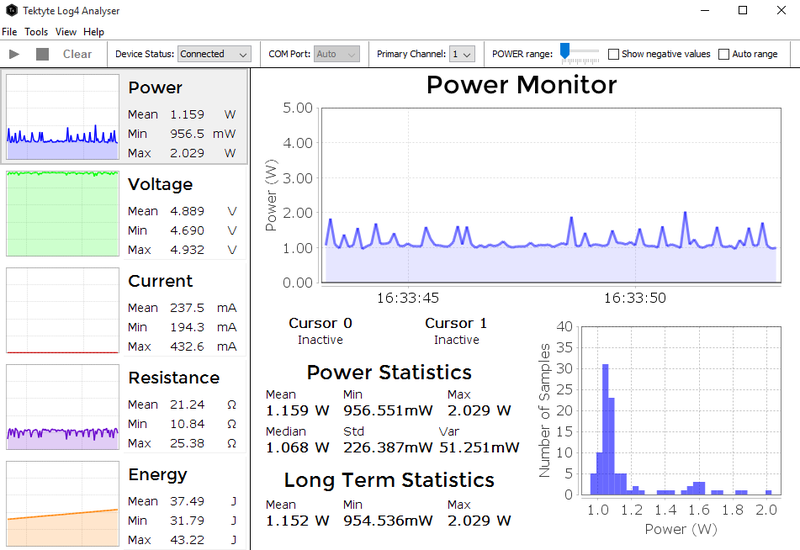 Current, voltage and power measurements on the default screen Fig. 7. Live streaming of data can be achieved through the Log4 Analyser. Download the free Desktop application Log4 Analyser from Tektyte Website. Connect USB IN to a USB power supply. Connect USB OUT to the device that needs to be measured (in this case, a Raspberry Pi). Connect Monitor USB to PC/ Laptop. The device should connect automatically and start live streaming of data shortly Fig. 8. The default sampling rate is set to be 10ms. If the Log4 Analyser is too slow or freezing, slow down the sampling rate on the device. See How to set Sample Period on LOG4.USB. If the data does not stream immediately, USB cable may be faulty. Try with different USB cable. If the data still does not stream immediately, see Troubleshooting LOG4.USB FAQ. Short press the Menu key for a list of settings. Use the Navigation Scroll Wheel on the left-hand side of the device to slide up and down the settings list, press inwards to select the desired option. Ensure the SD card is facing label side down and insert it into the SD card slot until it clicks into place as shown in Fig. 10. Make sure the SD card is in FAT 32 format. Short press START/STOP key to log data onto SD card.